Steven (Chicagoland, United States) on 28 May 2010 in Cityscape & Urban and Portfolio. Bronze baldacchinos are an integral part of the pavilion design. Inlaid on the floor of the pavilions are the WWII victory medal surrounded by the years "1941-1945" and the words "Victory on Land," "Victory at Sea," and "Victory in the Air." These sculptural elements celebrate the victory won in the Atlantic and Pacific Theaters. 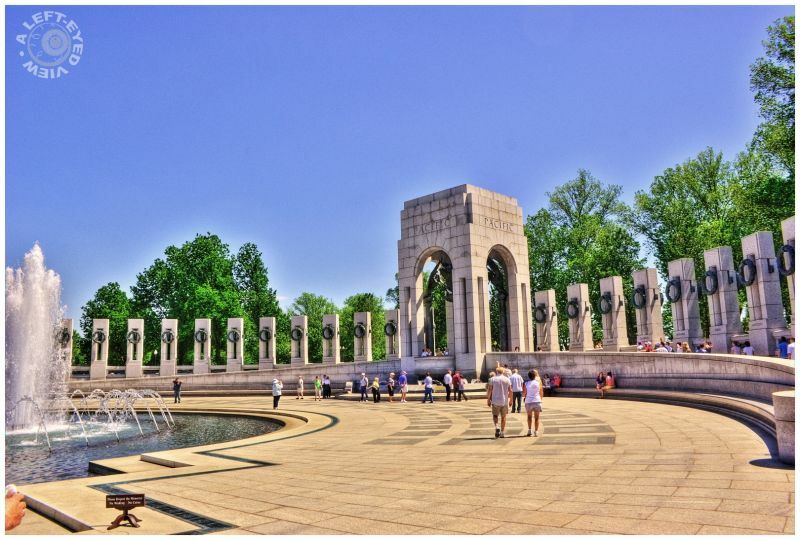 Fifty-six granite pillars (28 on the Pacific side and 28 on the Atlantic side of the pavilion) celebrate the unprecedented unity of the nation during WWII. The pillars are connected by a bronze sculpted rope that symbolizes the bonding of the nation. Each state and territory from that period and the District of Columbia is represented by a pillar adorned with oak and wheat bronze wreaths and inscribed with its name; the pillars are arranged in the order of entry into the Union, alternating south to north across the plaza beginning adjacent to the Field of Gold Stars. The 17-foot pillars are open in the center for greater transparency, and ample space between each allows viewing into and across the memorial. Photo captured in Washington, DC on May 5, 2010. It is like a Roman coliseum. I love the shape of this place. Your composition with the people is super. I like this angle and how you framed the shot. I've seen an image or two of this memorial but nothing as appealing as yours. I like the processing. Superb composition. Colours and light are very beautiful. Good saturday Steven. I can feel the solemn power through your photo. Thank you! Nice shot ! I think this fountain is one of the most beautiful I've seen in my life ! The pillars are reticent of older structures, carry a geometrical symmetry around the fountain and in doing so capture the eye, in particularly mine which is chasing around the circle in delight.